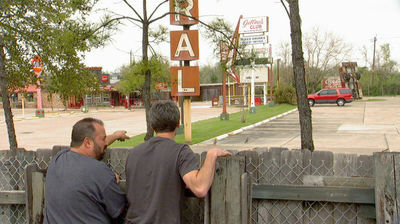 Looking for picks in Texas, the guys see a sign for Gilley's Club, the honky-tonk club made famous in the 1980 film Urban Cowboy. Soon they're face to face with country music superstar Mickey Gilley himself who has a warehouse jam-packed with rare Gilley's memorabilia. Later, Paul's sprawling junkyard features a staggering amount of stuff. His grandson Pride takes the guys on an adventure, and when it comes to negotiating, young Pride proves he's tough. Gilley steers the guys north to a peanut factory where Jim has preserved all the big-ticket items from Gilley's, including a mechanical bull. But when Frank gets a load of the bar's original grand piano played by many a music legend, a potential deal is music to his ears!